Spices- What’s a Mom to do? We do not have peanut allergies. But the whole cumin recall disaster has made me question our spices. Are the ones I’ve been using considered safe? Truly safe? I set out to find out. So next I called Tone’s. Tone’s confirmed the statement above, but clarified that the coconut is in the warehouse, but not packaged there. Coconut is not an issue for us, but I wanted to include that part for those of you who avoid coconut. The lady from Tones told me they have “strict clean outs” and they DO NOT label for “may contains” and there “could be shared lines” with dairy and eggs. 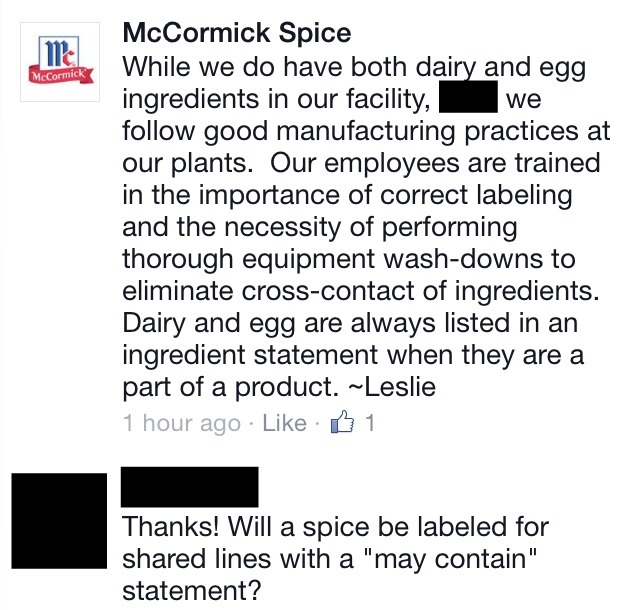 I jumped in on McCormick’s Facebook thread about the cumin recall and how their cumin isn’t included. That’s great news! However, I asked about dairy and egg in the facility and shared lines and this was the response. McCormick’s response to me. I didn’t get a response to my shared lines question. What’s a mom to do?!?! Go to her trusty “Milk Allergy Mommies” and ask questions, that’s what!!! Someone suggested Morton & Bassett spices. The mom had called and asked and was told it was a dairy and egg free facility. I called, too, to confirm. I need peace of mind. IT’S SAFE, PEOPLE! There are no dairy or eggs in the Morton and Bassett facility, according to the woman I spoke to on the phone. I gathered up all of my Tone’s and Hy-Vee spices and kicked them to the curb. Isn’t that dramatic, you might think? They used those spices for years. The thing is, sometimes after meals SG would have a mystery hive. I hate mystery hives. Maybe it was a trace amount from a spice? I really don’t know. But now that I know, I’M NOT TAKING ANY CHANCES! I rushed off to the store and spent a small fortune on safe Morton and Bassett spices. My poor Huzz… I was all in a tizzy the moment he walked in from a hard days work blathering on about spices and how much these new spices cost. So, I’ll just blather on with you about spices. That’s okay, right? The Huzz will appreciate you listening to me. Yesterday, I found another spice brand, JR Watkins, and called them. It took at least 10 minutes of me being on hold and going back and forth with the lady (nicely, of course) and SG dancing all over the aisles while I stood there… Yeah- fun! The end result- shared facilities. Not safe for us. I will stick with my new and safe brand- Morton and Bassett. I have to add- this recall is very scary for food allergy moms. I cook all of our meals. I rely on spices to make our food delicious. I also rely on the companies whose products I purchase. For food allergy parents, the results of these massive recalls can be catastrophic and life ending. Here’s what I will continue to do. I will continue to make my small voice heard by calling companies and asking questions about allergens, shared lines and shared facilities. It’s important to speak up and be heard. Let us let companies know allergens are big deals and we want clearer labeling! I’m dreaming of more legislation about clear labeling for shared lines and shared facilities. What are your thoughts on the cumin recall? Do you have a brand of spices you use? Have you called them and asked about shared lines and shared facilities? Please share your thoughts in the comments below. Now that title is a mouthful! I couldn’t think of a cute name and I didn’t want to copy the original recipe’s name. 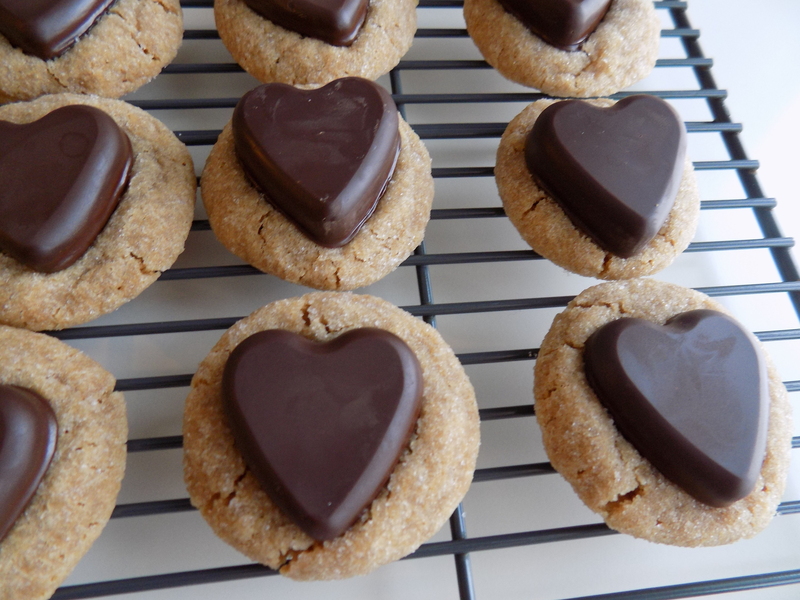 I want y’all to know these babies are topped with homemade chocolate candy hearts. Whoop, whoop!!! I’m seriously like a giddy little schoolgirl, y’all. For real. 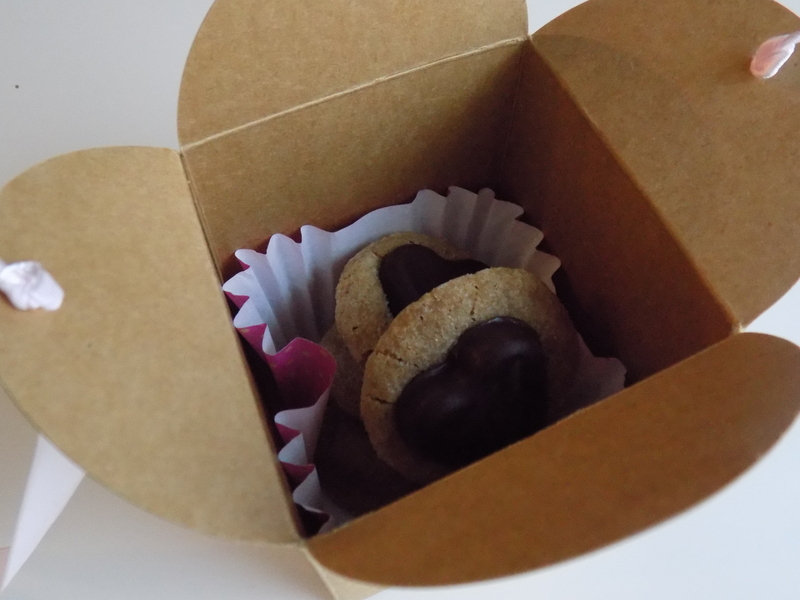 I made these just in time for Valentine’s Day, although I’m not sure they’ll last 48 hours… The Huzz is nick named the Cookie Monster for a reason. I found Sally’s recipe on Pinterest. I had just the day before purchased a silicone heart mold from HyVee for just a $1. 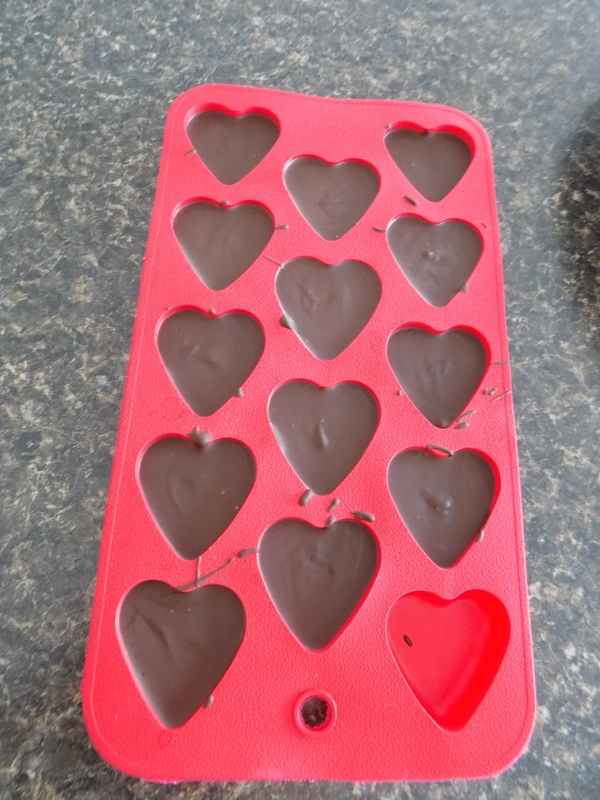 I thought I’d just make some chocolate candies for us for Valentine’s Day. Then I saw her pin and got pumped up. I can make pretty food, too. It just takes more effort. And some experimenting. And I’m proud to say I adapted it just right the first time around. Yay! 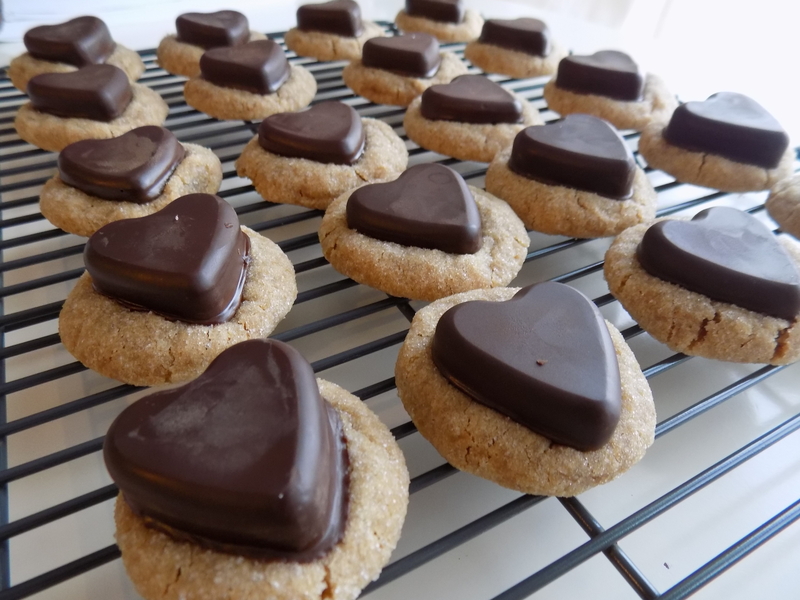 Here’s how I made these awesome cookies. I used peanut butter because we don’t have peanut allergies. I’m guessing Wow Butter or SunButter would work well, too. I personally like the way Wow Butter tastes better than SunButter. But I digress. Slightly melt the vegan butter in the microwave. Make it just soft enough to be mixed well with the sugars. Use a large bowl with a hand mixer or a mixer with a stand. Add the sugars and vegan butter and mix well. Add the applesauce and mix well. Add the baking soda & flour and mix until just well blended. Don’t overmix. Put dough in the fridge for 30 minutes to chill. 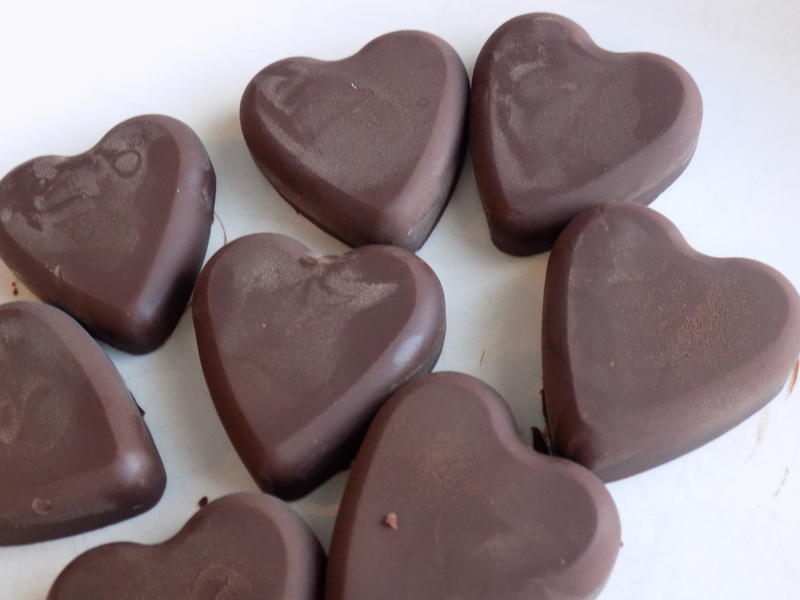 Now it’s time to make the chocolate candy hearts. I didn’t measure. 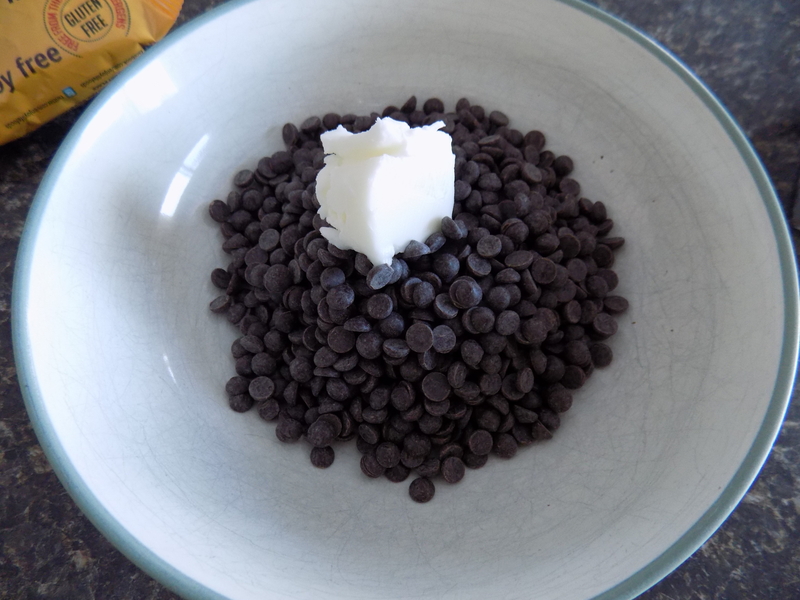 I just eyeballed the chocolate chips and added a dollop of shortening. I bet you could use coconut oil instead of the shortening if you wanted. I melted my chips & shortening in the microwave for 20 seconds at a time, stirring in between times. Stir until chocolate is completely melted and smooth. These are firm to the touch and ready for the cookies. Bake cookies for 8-9 minutes- until the cookies just start to crack. The original recipe said that and at 8 minutes my cookies didn’t crack- I needed 9 minutes with my oven. 9 minutes were perfect! 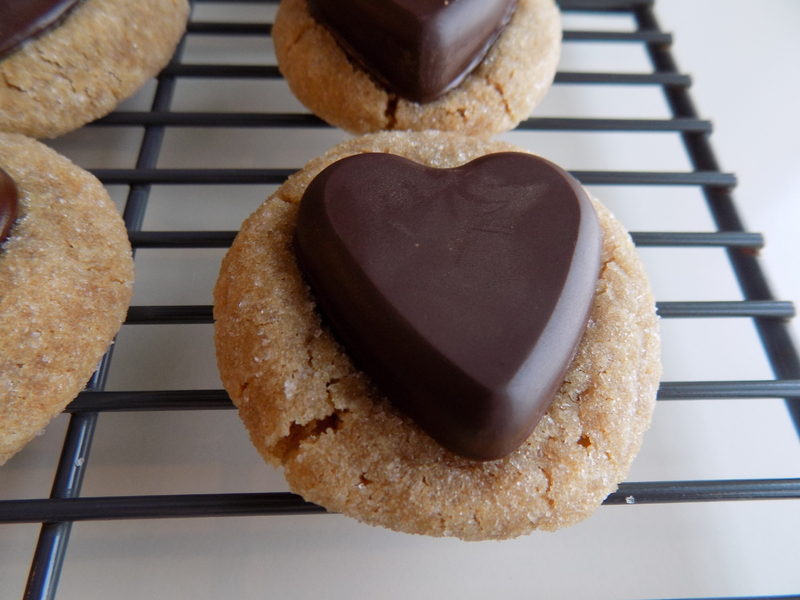 When you pull the cookies out of the oven, immediately top the cookies with the chocolate hearts. I gently pushed them into the cookies. Put the cookie sheet directly into the freezer so the homemade chocolates don’t completely melt. 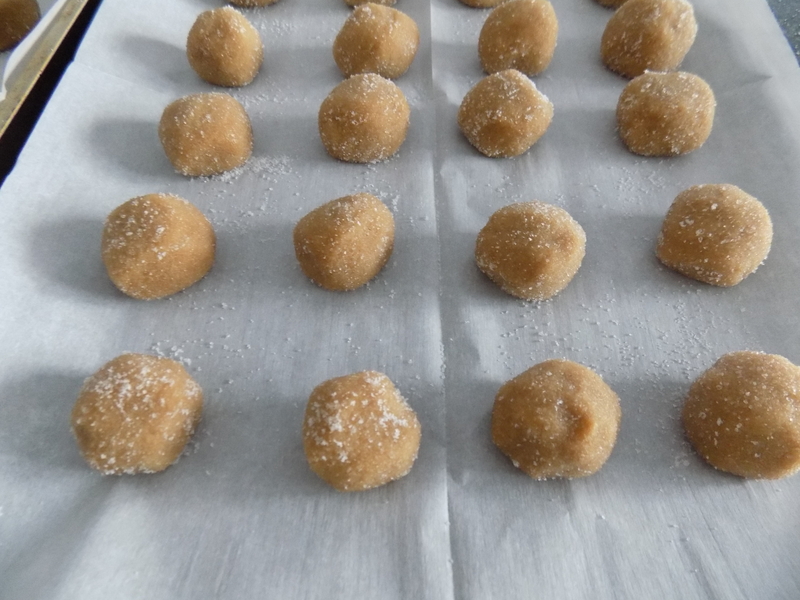 Freeze the cookies for 15 minutes. Enjoy your cookies and bask in your beautiful creation… I did! 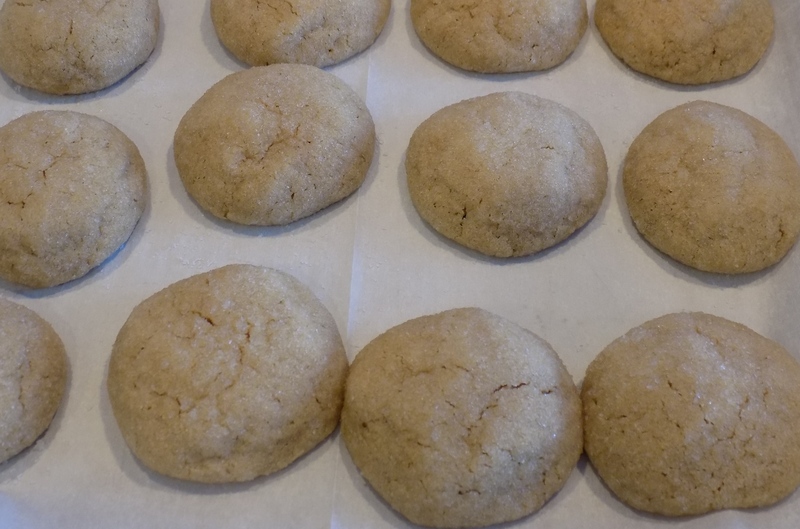 Cracked Peanut Butter Cookies- Just Right! 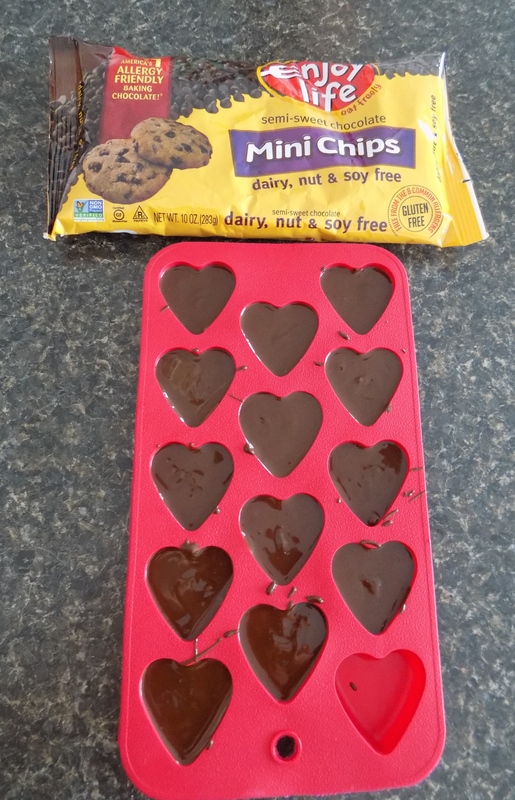 Frozen Chocolate Hearts Ready for the Cookies! I can’t believe I made these little pretties!!! This also make great gifts for the special people in your life. 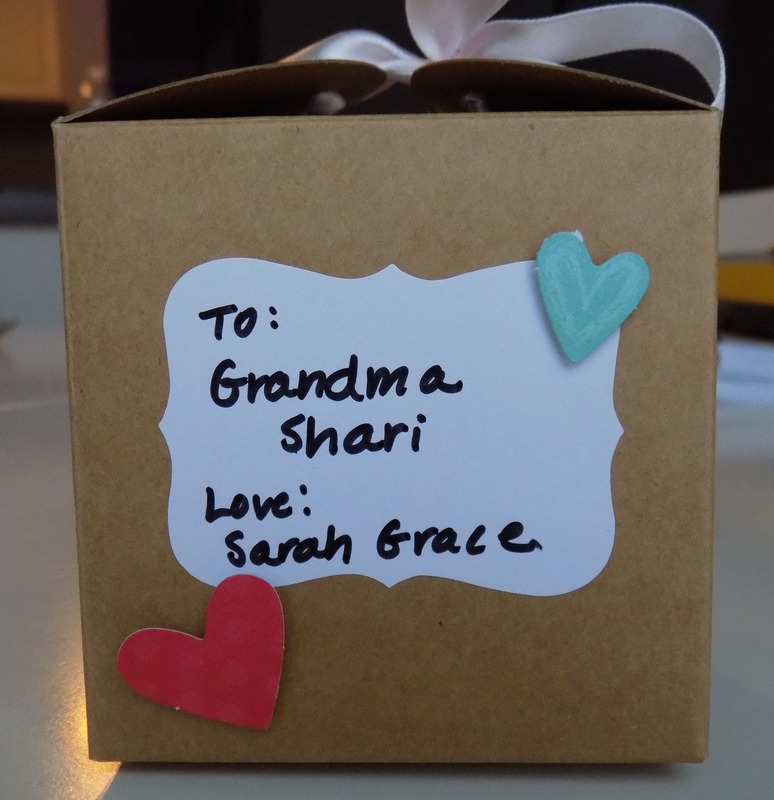 I used a box I picked up on clearance, a cute square muffin liner, a label & some Dollar Spot stickers to put our gift together. 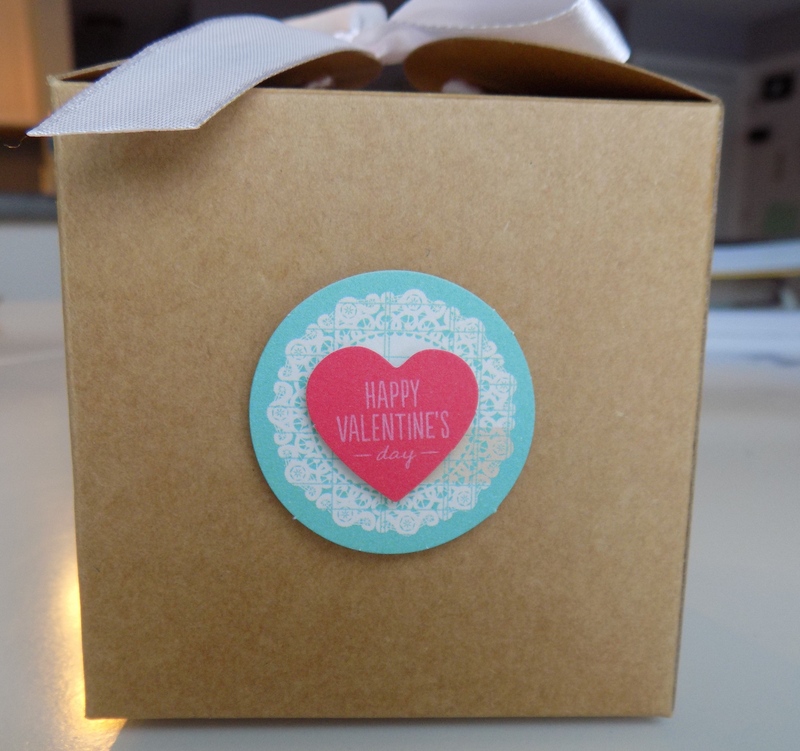 We are enjoying our special Valentine’s cookies. Happy Valentine’s Day from our Blessed Little Family to yours! 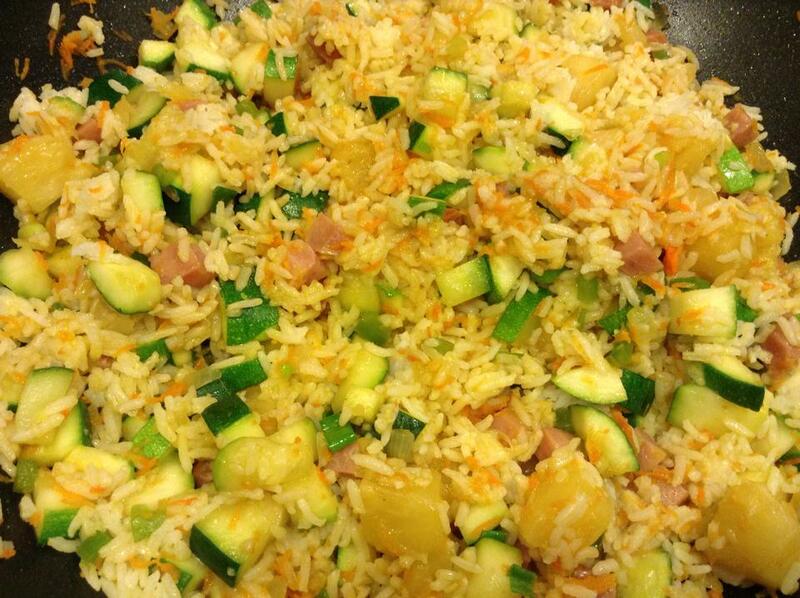 Budget Friendly Pineapple Fried Rice with Ham. I now omit the ham and it tastes just as good! This recipe makes a lot! Our grocery budget is a monster. Do y’all food allergy parents know what I mean? I mean, it’s CRAZY! And ya know what makes it even crazier? We don’t even eat extravagantly. Our safe foods are just THAT expensive. I sat down and tried to brainstorm the most budget friendly tried and true recipes I could think of. We are in Financial Peace University again as table leaders and really have budgeting on the brain. I really want to cut our grocery bill each month. My recipes might start looking a lot like these from now on since I’m trying to trim the giant grocery bill. If you want to get ahead of the menu planning game and like freezer cooking, the recipes that have stars are freezer friendly. The chicken tacos are probably the most expensive dinner on this list because of the type of chicken we like and because of the fresh toppings. I can plan another dinner or two that also uses those fresh produce ingredients like nachos or soup and salad night. That helps lower the cost of the grocery bill & helps fresh produce not to go to waste. I can also stretch the budget by stocking up on the chicken when it goes on sale. I also buy dried beans. It’s easy to soak and cook the beans. I think I get 6-8 cups from one bag of dried black beans (my memory is a little fuzzy on this number.) The beans cost $1.18. Much cheaper than canned! I freeze my beans in one cup portions and pull them out as needed. 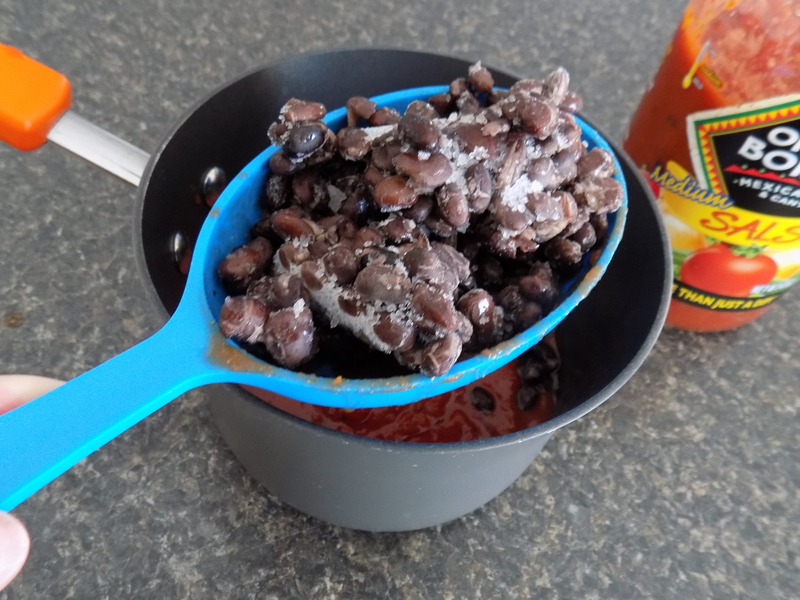 A quick defrost in the microwave and the beans are good to go! 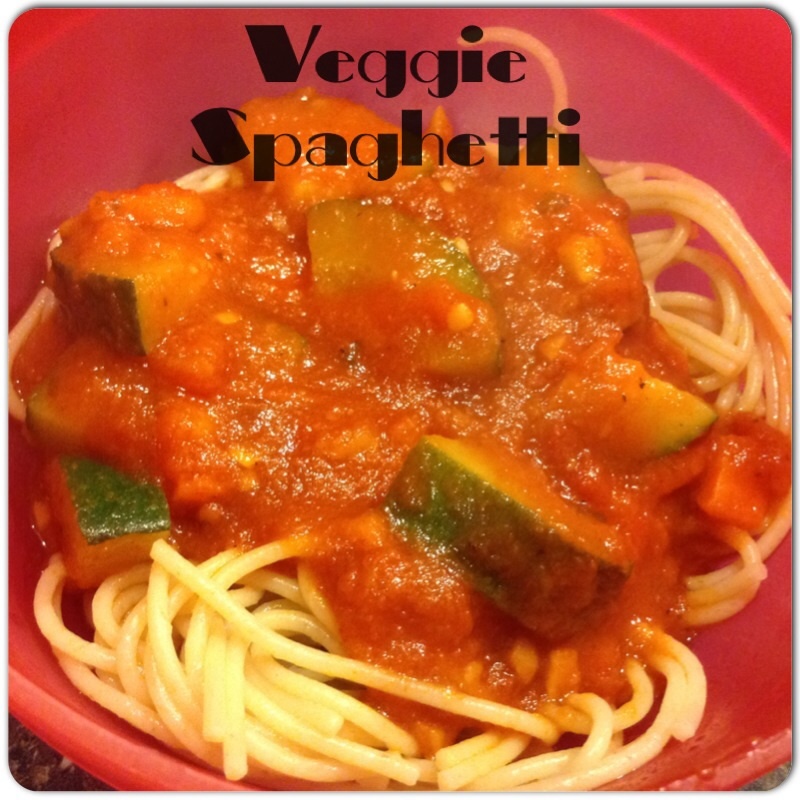 Do you have some food allergy & budget friendly dinner ideas? Please share in the comments below. I love leftovers! My little family is quite happy to eat the same exact meal two nights in a row, as am I. However, I’ve been trying to be more creative in my menu planning. Leftover drumsticks? Pick the meat off and use it for a new recipe the next day. Leftover chicken breast? Chop it or shred it for tomorrow’s lunch or dinner. Here’s a list of ideas of what to do with leftover chicken. Numbers 7 & 10 use a homemade pizza dough. It’s not quick, but it is easy because it uses the bread machine to make the dough. Use a safe pre-made dough for these if you’re short on time. I love cooking chicken once and using it for two meals. 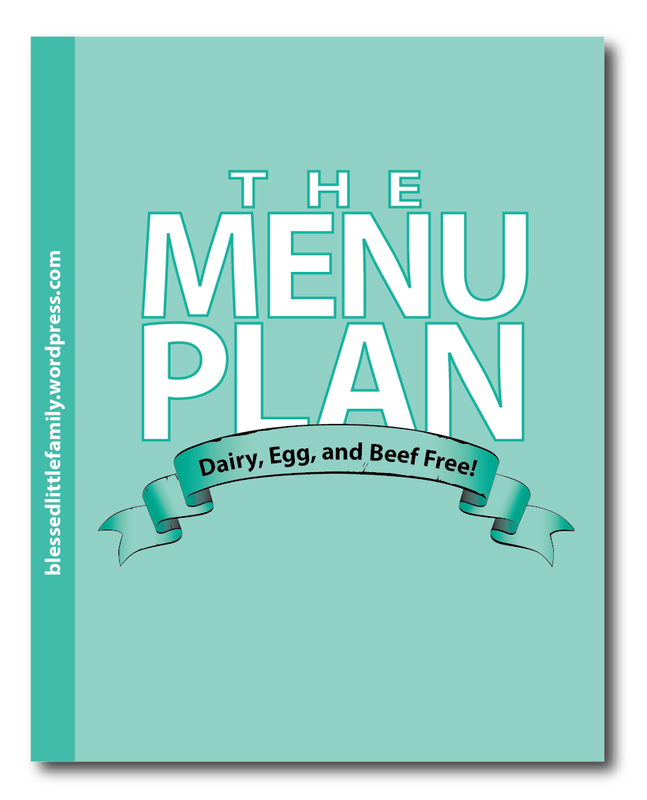 If you menu plan, print this list and keep it handy. It will help you plan easy meals for leftover chicken. I know I’m excited to use this list when I menu plan. I hope these 11 quick and easy ideas for leftovers help with stretching the budget and menu planning. I jokingly called this “Chip Dip” and it has stuck. 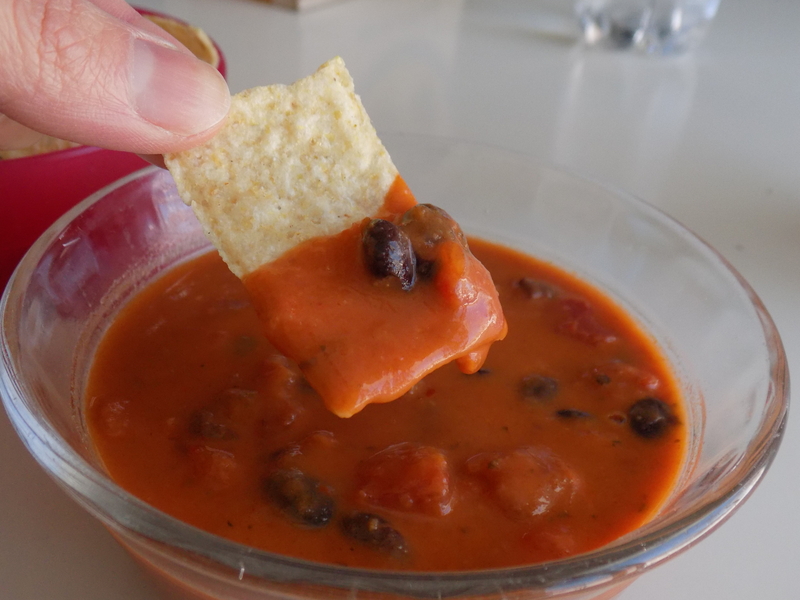 Otherwise named by me as vegan queso bean dip… also known as my new obsession for my lunches. 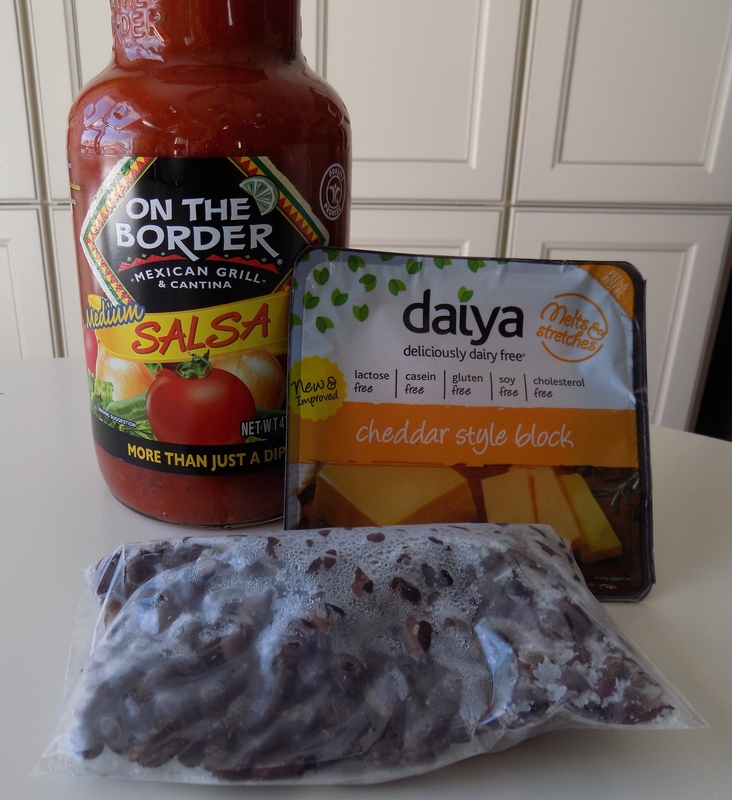 It has just three ingredients: Daiya cheddar style block, salsa, & black beans. And it’s SO, SO good! The beans were apparently just what my body needed, because I felt great all afternoon! I didn’t even need my usual afternoon cup of coffee. 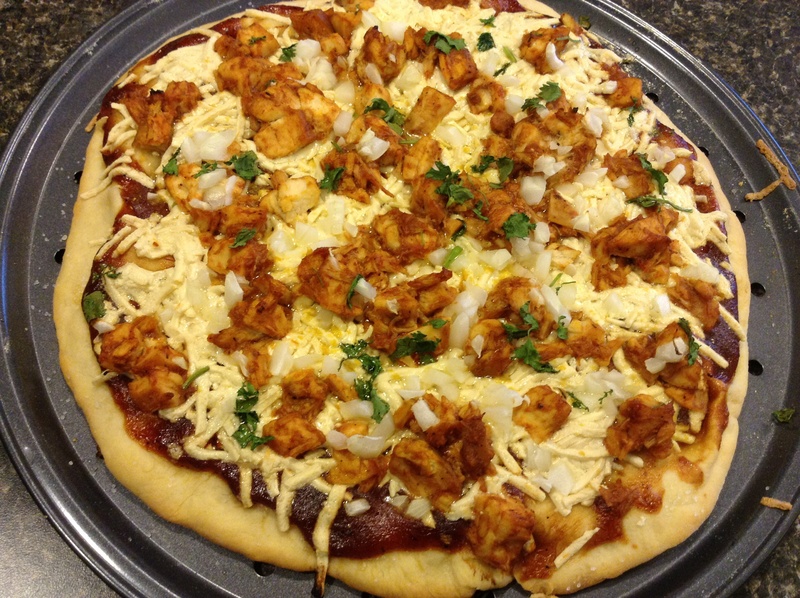 This recipe is so easy and I’m just lovin’ it! Today I measured the ingredients for the sake of this post, but I usually don’t measure. You can’t really mess this up. 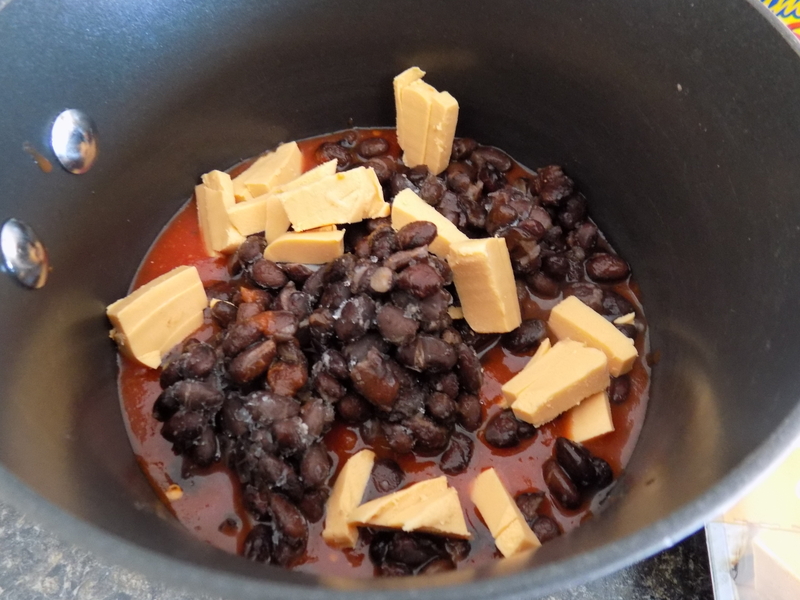 Add salsa, beans, & cheddar pieces to a pot. 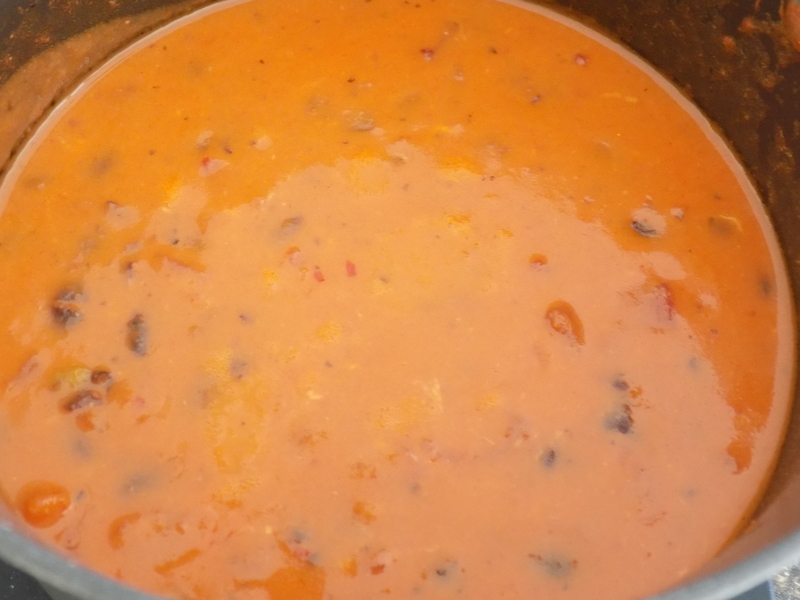 Heat until cheese is melted and the dip is well mixed and heated through. Add more cheese if the dip isn’t cheesy enough or add more salsa if it’s too cheesy. Serve as a dip with tortillas. 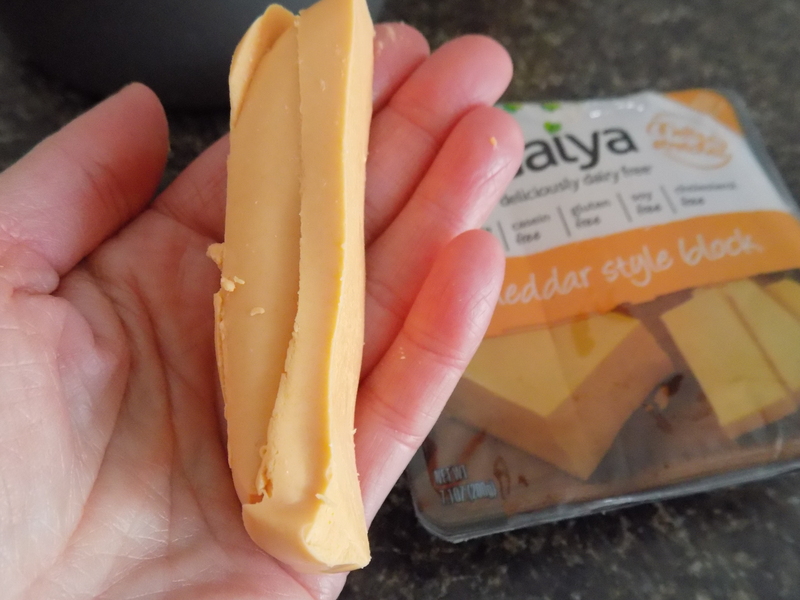 I started off with this much “cheese.” I later added another strip of Daiya to make it a bit cheesier. I like the dip to be about this color. Yum! 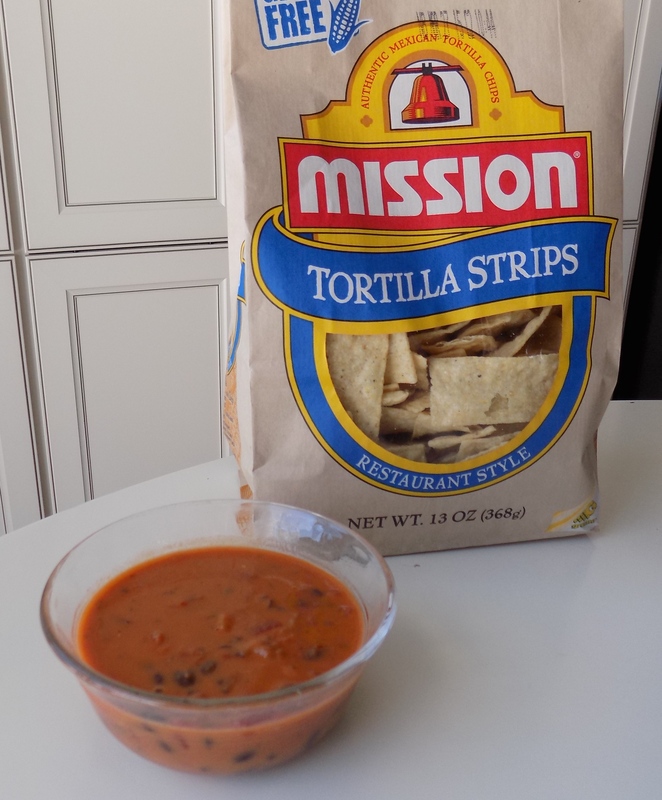 Mission is our favorite brand for tortilla chips. This is my new favorite lunch. Not only is this a rockin’ lunch, but this would also be a great dip to bring to a potluck or to serve at the next big game. I hope y’all enjoy this as much as I do! P.S. 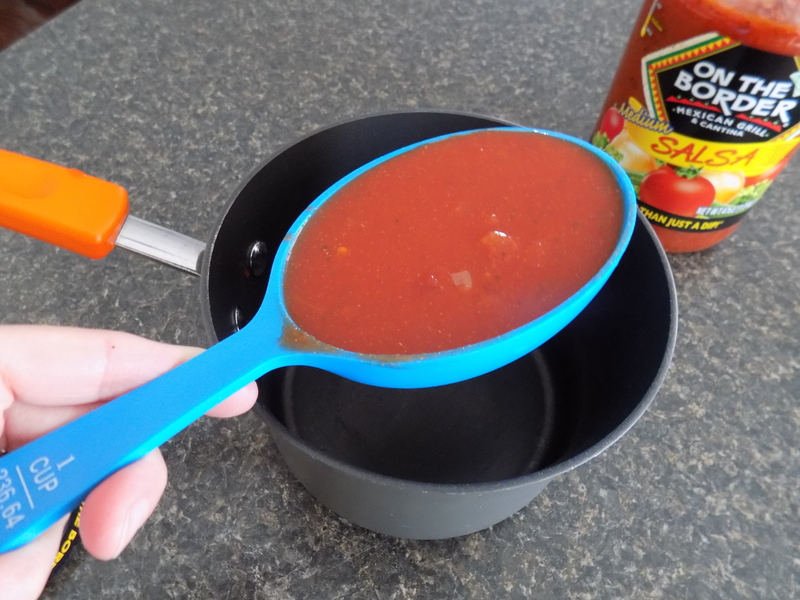 Did you notice the cute blue measuring spoon with the super long handle? 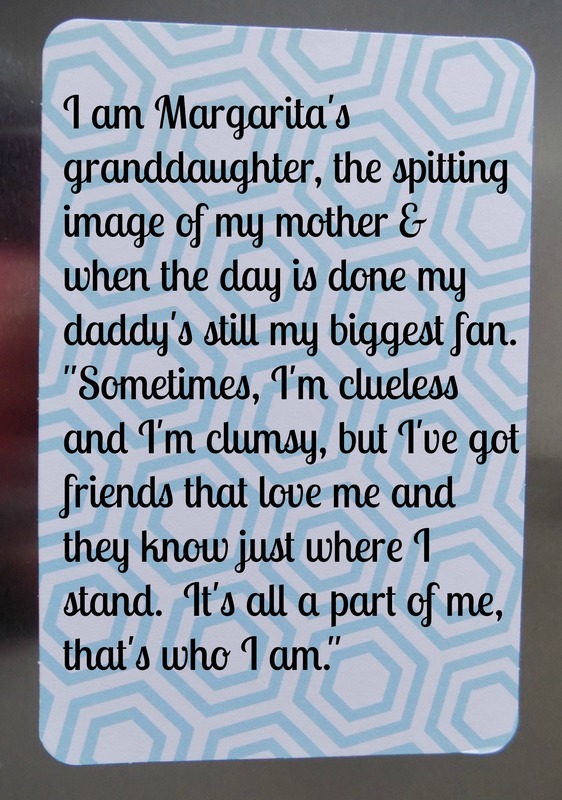 I recently bought them at Hobby Lobby and I LOVE them. They are so much fun! It’s the little things, ya know? I have been working hard on this menu- on and off since early January. It’s finally ready, y’all. Whew! 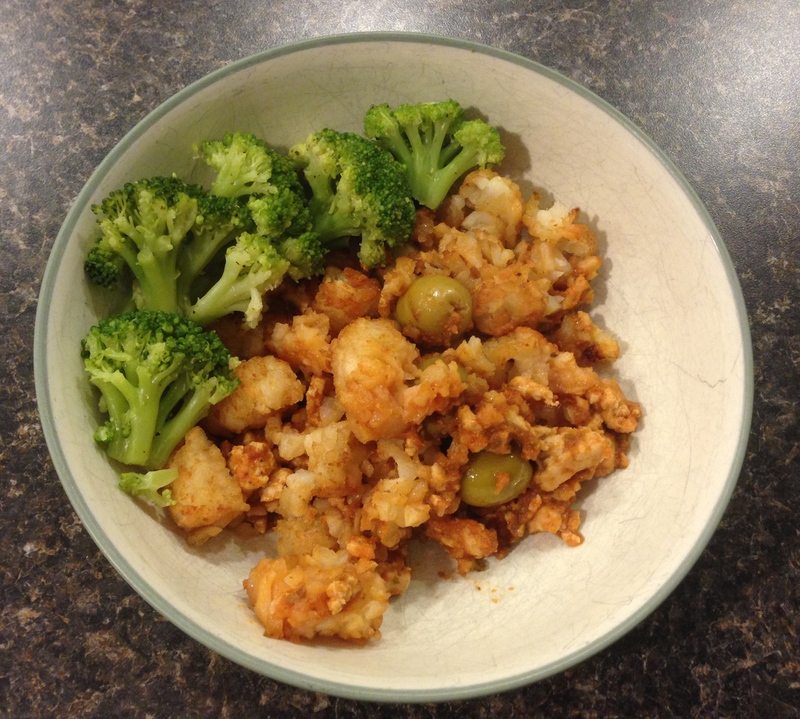 We had the roasted broccoli from Day 1 last night (see, I’m already off schedule!) and the Huzz declared it restaurant worthy!!! I’m going to start roasting broccoli, folks, instead of steaming it. It was SO good! There ya have it friends… our menu for the month of February. Happy eating!